ARCHICAD 19 is now faster than ever! No more waiting for views to load. GRAPHISOFT has extended its robust 64-bit and multi-processing technologies with background processing - an industry first for BIM. So ARCHICAD now offers lightning-fast response times and this turbo-charged update to ARCHICAD makes it the undisputed speed leader in the BIM business. ARCHICAD 19 offers industry-first, real-time BIM collaboration regardless of the size, location or distribution of the collaborating team. ARCHICAD 19 takes advantage of unused computer capacity by anticipating what you might do next - and preparing those actions in the background. ARCHICAD 19 makes the most time- consuming and often boring part of an architect's work much more fun. 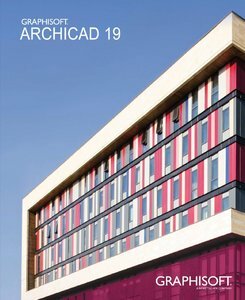 ARCHICAD 19 provides major work environment improvements for both Mac and Windows users. Improved IFC-based collaboration and collision detection (using the MEP Modeler add-on) improves OPEN BIM collaboration between architects and engineers. ARCHICAD 19 Update 6006 203415 BIMx/CRASH: BIMx could crash during start-up on Mac OSX 10.10 and 10.11 if CodeMeter driver was of version 6.10a. 201051 BIMx/DOCUMENT: ARCHICAD changed the Autotexts on Layouts when it exported a BIMx Hyper-model documentation. 202381 CRASH: ARCHICAD crashed when saving a View from 3D with a named rendering scene. 201693 CRASH: ARCHICAD crashed when trying to place a new window if certain IFC properties were displayed in the marker of the default window settings. 201894 DOCUMENT/CRASH: Detail window dimension entry in certain cases caused a crash. 204726 DOCUMENT/CRASH: In certain cases a project crashed when opening the Book Settings. 206474 DOCUMENT/EDIT: Dimension points disappeared when the current View was refreshed. 192078 DOCUMENT/GDL/EDIT: Injecting parameters into Interior Elevations at times caused incorrect floor plan Marker display. 204124 DOCUMENT/Description: The connection status of a Descriptionter in a MAC environment in certain cases remained on "not defined yet." 202928 DOCUMENT/SCHEDULE: If new Library Part parameters were added, existing IFC parameters would be removed. 186905 DOCUMENT: In a few cases Schedule and Zone Area values were erroneously rounded. 205087 DOCUMENT: It was impossible to rename the ID of the Layout folders. 196514 DOCUMENT: New layouts were not created in the selected folder of the Layout Book but on the same hierarchical level. 194564 DOCUMENT: The background fill of Texts was not the same color on Layouts as it was in the View Map. 194829 EDIT/CRASH: Adding skins to certain composite structures at times caused ARCHICAD to crash. 204080 EDIT: Active snap guides in an inactive instance of ARCHICAD could lead to a memory leak. 206597 EDIT: ARCHICAD crashed when copy-pasting Mark-Up elements that contained a polyline. 130300 EDIT: Element ID value of MEP objects was not growing when multiple instances were placed in a row. 196894 EDIT: Find & Select could not list and find gradient fills. 197434 EDIT: Magic Wand falsely used hidden layer elements when it created fills on Section/Elevation. 204685 EDIT: The explode process in certain cases created invalid elements. 202254 EDIT: Thickness of a composite slab was not recalculated if the used composite structure was deleted and replaced. 195999 EDIT: When the Quick Option Palette was active, the mouse flickered while creating Snap Guides and Points on a trace and reference layer. 203317 FILE/DWF/EXPORT: During DWF export some randomly selected drawings on the layout were exported with a solid color fill in the background. 204420 FILE/DWG/EXPORT: Names of layouts were not exported as given in the Publisher Set if they were merged into one DWG file. 196462 FILE/DWG/EXPORT: Object's texts created block attributes named after a random library part parameter. 198539 FILE/DWG/EXPORT: The layout containing a rotated view exported incorrect coordinates to DWG output. 196218 FILE/DWG: When a text was created as a Block Reference in AutoCAD and it was imported as a GDL object into ARCHICAD, the text wrap failed. 200927 FILE/EPX/EXPORT: After .epx file export the generated .bmp file was not removed. 196824 FILE/IFC/DOCUMENTATION: Schedules were not refreshed automatically when the IFC mapping was changed. 204509 FILE/IFC/EDIT/CRASH: Using the Eyedropper tool on a Door which had IFC properties mapped into its Door Stamp in certain cases caused a crash. 204846 FILE/IFC/EXPORT: ARCHICAD crashed when saving IFC data with All BIM Parameters option checked. 171082 FILE/IFC/IMPORT: Certain IFC roofs were imported incorrectly into ARCHICAD. 202948 FILE/IFC/IMPORT: Circular Columns imported from IFC files in certain cases displayed incorrect diameter values in their Settings Dialog. 197012 FILE/MERGE/DWG: The Scaling choice in the DWG merge dialog could only be confirmed with a mouse click. Enter failed to confirm the choice. 207169 FILE/OPEN/CRASH: ARCHICAD 19 in some cases crashed when migrating a project from version 17. 193183 FILE/OPEN: It was impossible to shrink the open-save dialog in Windows 10. 207197 FILE/PRINT: In some cases a print to file resulted in a .prn file with a Chinese name. 195907 FILE/SAVE: The output of distinct pictures from 3D views placed on different layouts were overwritten by the first encountered picture during publication to DWG. 194867 FREEZE: Almost parallel/perpendicular edges of a roof caused a freeze in ARCHICAD. 201947 GDL: GLOB_SCALE returned 0 with a newly created 3D document. 201236 GDL: Tags and Categories label did not offer all available properties in the Settings dialog under certain circumstances. 203118 MODEL/EDIT: Editing Meshes was slow in certain cases. 197285 MODEL/EDIT: A zoom possible caused inaccurate display of trimmed lines. 202125 MODEL/EDIT: Complex Profiled beams with 0x0 height&width in certain cases caused a crash. 204524 MODEL/FREEZE: In some cases, a project froze because of curved walls. 195967 MODEL: Beams did not intersect if their floor plan projections were not exactly parallel. 203135 MODEL: Content of an already open Section was not recalculated if it contained a Door/Window that was not background multiprocessing compatible. 203787 MODEL: If the default layer for the StairMaker tool was missing a stair could not be modified. 203494 MODEL: Mesh selection and modification performance in the 3D window was not optimal. 203197 MODEL: Opening a Marqueed area in 3D was slow in certain cases. 203406 MODEL: Texture handling in special cases was slower in v19 than v18. 203408 MODEL: Texture rendering performance in the 3D window was not optimal. 202484 MODEL: The triangulation in PGON was invalid. 193394 USER INTERFACE/GDL: ThermalTransmittance values were incorrectly changed to integers, if a comma was used as decimal separator instead of dot in the U-value of doors/windows. 202968 USER INTERFACE: A mounted file server on OS X 10.11 could cause the authentication dialog to pop up from time to time. 207640 USER INTERFACE: In the quick option palette the renovation filter option showed "Missing element." GraphiSoft ArchiCAD 19 Build 6006 download links are externally hosted on Extabit, Rapidshare, Rapidgator, Netload, Uploaded and GraphiSoft ArchiCAD 19 Build 6006 also available directly on Torrent Sources.